Have you checked out the Rowan Classic Bambino book - such cute things in there. 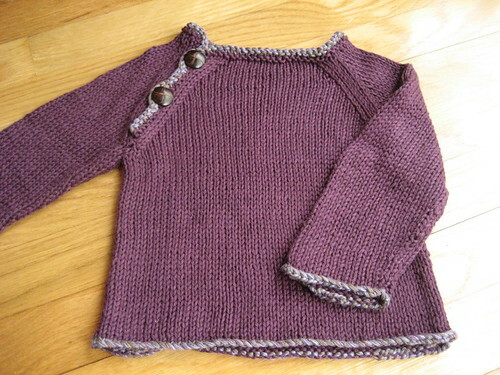 I knit this http://akaijen.typepad.com/jen_knits/2007/03/bobby_cardigan.html for 3 nephews and a friend's daughter. I never managed to get it done in time for any of them to wear it. So, I can't recommend stripes as they just take too long, for me anyway. Anyway, it's a seriously cute pattern though, and the book is chock full of classics. I love the colors of both sweaters! Pink clothes are cute for little girls, but a lovely dark colored sweater is so refreshing! And actually, will certainly match any of the pink things. I'm guessing you went with surgery. How did it go? Aww..just say you're nervous and no one will look down on you. You're so lucky to be having a baby. I love them when they're so little, when everything is new to them and you can act like a total goofball and they think it's the greatest thing in the world. Cheryl makes great baby sweaters! 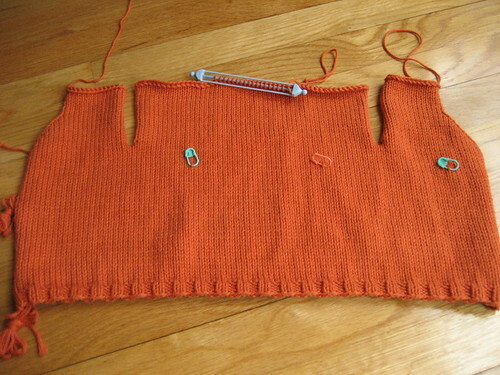 Hope the sweater surgery went well - I love the orange color! Monica--gorgeous sweaters. I know the sweater surgery will be successful, it's in talented hands! I do love those sophisticated colors, sometimes pink is just so... pink. Much as I hate to frog, I would never attempt surgery, but you're so talented, I'm guessing that's the route you are going to take. Gutsy move! Please, please, please post pix when you're done! Hope you're feeling well, other than the exhaustion! I remember telling people that pink was not a required color as I never liked pink. Guess what?? I got a princess who is obsessed with the color pink! Good luck! Tuesday, March 20, 2007 3:59 PM by Beth S.
I was wondering if you'd gone and had the baby already! :-) Guess not. Cheryl does such beautiful work. The little sweater is adorable! I completely love that orange! I'm guessing you played surgeon. Can't wait to see how it turns out. Woo hoo for surgery on baby knits! And it's 35 weeks already? Wow, time flies fast! I can't wait for her to arrive (I'm sure you feel the same way too)! I've been wondering where you've been - if you've finished your project, so to speak! I love both sweaters! I bet you are a brave soul and went for surgery. 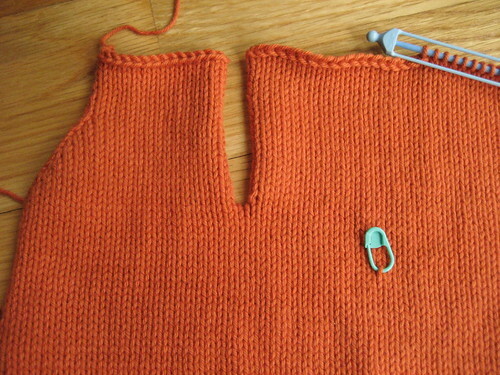 I've done the armholes/neck shaping bit so many times. Pregnant and unpregnant! I love your color choices. I'm all for nontraditional colors on babies. Pastel pinks and blues are so... dull. I think my baby girl has one light pink sweater and the others? Browns, reds, bright blues, oranges. Love the purple sweater for the wee one. I totally would have goofed on the orange sweater as well. I do things like that all the time. 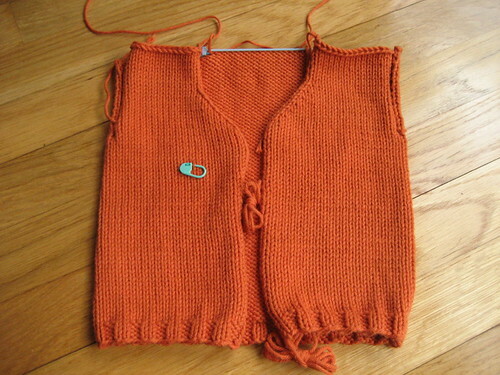 I can't wait to see how you fix it and how the cardi turns out. I love that gift from Cheryl! Lucky little baby!